Piet Mondrian’s Broadway Boogie Woogie (1942–1943) was examined using Macro X-Ray Fluorescence mapping (MA-XRF) to help characterize the artist’s materials and understand his creative process as well as the current condition issues of the painting. The presence and distribution of key chemical elements was used to identify the main pigments in the different paint layers and under-layers, namely titanium white/barium sulfate, zinc white, bone black, cadmium yellow and/or cadmium-zinc yellow, cadmium red and/or cadmium-barium red and ultramarine. The XRF data was also examined using a multivariate curve resolution-alternating least square (MCR-ALS) approach to virtually separate and help characterize the different paint layers. Results suggest that Broadway Boogie Woogie was originally conceived as an asymmetrical grid of interlacing red and yellow bars. Mondrian then reworked the composition extensively breaking the bars by painting small squares in red, blue and gray and repainting them over and over again changing their size, color or tonality, and by adding and reworking large colored shapes in the background. Mondrian scraped off the paint in some areas before making adjustments to the composition but did not do it consistently throughout the painting. The yellow paint on the surface is severely cracked. Wherever red paint has been covered with yellow paint, it has oozed through the cracks in the top layer. The results illustrate how the MA-XRF / MCR-ALS approach can complement the examination of a painting and contribute to the understanding of the artist’s process and choice of materials in a non-invasive way. Broadway Boogie Woogie (Fig. 1) is one of Mondrian’s most emblematic paintings and his last finished work. It was painted in New York between June 1942 and March 1943 and it entered The Museum of Modern Art collection shortly after it was exhibited for the first time at the Valentine Dudensing Gallery in March 1943 . Inspired some say by the New York city grid and the syncopated rhythm of Boogie Woogie, Mondrian abandons the distinctive black grid of his preceding Transatlantic Paintings series  and replaces it with intersecting yellow bars punctuated by bright red, blue and light gray squares against a white background. Contrasting however with his seemingly restrained palette is the diversity of materials he used as well as the extensive reworking of the surface as clearly evidenced during the examination under ultraviolet light (UV) (Fig. 2) and X-radiography (Fig. 3). The painting shows condition issues in the yellow areas and particularly when it was applied over red paint. The yellow paint has cracked over time and red paint oozing through the cracks has been documented since 1990. Moreover, both yellow and red paints are water sensitive . The possible causes for the painting’s current condition are being investigated as part of an ongoing project to document and examine Mondrian’s paintings in the museum collection . Mondrian’s choice of materials and the consecutive conservation treatments, in particular the wax lining performed in 1958 , may have contributed to the evolving condition of the painting. Analysis done in the past  on paint samples taken from the painting using Polarized Light Microscopy (PLM) and Scanning Electron Microscopy with Energy Dispersive Spectroscopy (SEM–EDS) identified some of the pigments and fillers namely cadmium yellow, cadmium yellow lithopone, cadmium red, cadmium red lithopone, an organic red, titanium oxide/barium sulfate composite white, zinc white, synthetic ultramarine blue and small amounts of fillers such as barium sulfate, calcite and quartz. The purpose of this study was to confirm and complement these findings using Macroscopic X-ray fluorescence analysis (MA-XRF). Macroscopic X-ray fluorescence analysis is an imaging method capable of providing information in a noninvasive way on both surface and stratigraphic distribution of key chemical elements representative of the pigments and fillers in the paint layers . The technique is gaining widespread popularity in the field of cultural heritage since it was first presented in 2008  and has been used with great success to reveal and visualize hidden compositions in paintings by Van Gogh and Magritte among others [6–11]. It has also provided meaningful insight into the technique of artists such as Rembrandt [12, 13] and Pollock . The interpretation and comparison of elemental distribution maps becomes challenging however when several elements are associated together in the same paint or paint ingredient, or when a particular element is present in more than one paint ingredient, paint or paint layer. Multivariate image analysis methods can be used to simultaneously identify and visualize elements that are correlated together and to decompose the signal of a single element into its different contributions. Mixtures decomposition algorithms have been used in the past to examine multispectral data of paintings and help characterize the chemical composition of the paints in a spatially resolved manner. Non-negative factor analysis (NMF) for example is a matrix factorization method that has been used to discriminate between two Co containing pigments in a Rembrandt painting  and to identify the presence of an anachronistic pigment containing Cd, Se, Ba and Zn (modern cadmium red lithopone) in forgeries of historical enamels . Endmember extraction methods, on the other hand, have been used to study and map pigments and binders in paintings using multispectral visible and near-infrared imaging spectroscopy [17, 18]. In this paper, we propose the use multivariate curve resolution-alternating least squares (MCR-ALS) [19, 20], another popular spectral unmixing method that has been used in the interpretation of Raman, FTIR, TOF–SIMS, LC–MS and EDXRF imaging data [21–24]. When applied to multispectral imaging, MCR-ALS analysis assumes that the spectrum of each pixel can be decomposed into the contributions of “pure” components and will proceed to extract both their individual spectrum and a measure of their concentration or relative abundance. Generally a pure component, in the context of MCR-ALS of imaging data, is a chemical compound that can be identified through its characteristic spectrum, and the abundance of this chemical compound can be rendered as a spatial distribution map. 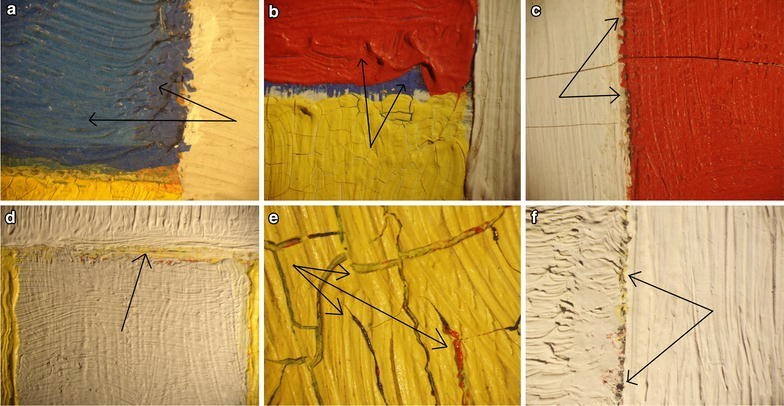 This paper aims to demonstrate that in the context of XRF-mapping of paintings, the pure components extracted with MCR-ALS can represent the different paints used by the artist or the paint ingredients in those paints namely pigments and fillers. The pure component spectra can thus be used to elucidate the elemental composition of the paints, while the pure component distribution maps can be used to visualize the different paints and paint layers independently and thus deconstruct the artist process. This study will illustrate how the combined MA-XRF/MCR-ALS approach can contribute to a better understanding of the artist’s choice of materials and process in a noninvasive way. MA-XRF maps were collected using a Bruker M6 Jetstream Instrument from Bruker . This instrument consists of a measuring head that moves in front of the surface of the painting at a 1–2 cm distance by means of an XY-motorized stage (10 μm minimum step size and 800 × 600 mm maximum travel range). The measuring head consists of a Rh-target microfocus X-ray tube (30 W, 50 kV maximum voltage, 0.6 mA maximum current), and a 30 mm2 X-Flash silicon drift detector (energy resolution <145 eV at Mn-K∝). The beam size is defined by poly-capillary optics and is determined by the distance between the painting and the measuring head. Due to the large dimensions of the painting, a total of seven maps were acquired in order to map the whole surface. The distribution maps and spectra presented in this paper are generally relative to one of the mapped area but are representative of the other six. The X-ray tube settings were 40 kV and 0.5 mA; 0.75 mm step size, 80 ms/step dwell time and 0.35 mm diameter estimated beam size. The data was collected and examined with the Bruker M6 Jetstream software package. The chemical elements detected by the instrument were identified in each scan by examining the overall spectral summation and the maximum pixel intensity spectra . The elemental maps were obtained using the Datamuncher software  after fitting the data with the PyMCA software . In situ XRF spot analysis was carried out on forty-two spots on the recto and verso of the painting to confirm and complement the MA-XRF analysis and using a Bruker Tracer III-SDD handheld XRF instrument with a Rh excitation source and silicon drift detector (5 mm diameter approximate spot size). A helium purge was used to improve the sensitivity to low Z elements (Mg, Al and Si). The instrument was operated at 40 kV and 1 µA and spectra were acquired for 120 s.
Fourier transform infrared spectroscopy analysis (FTIR) was carried on micro-samples of white, yellow, red, blue and gray paints using a Nicolet iS50-FTIR coupled with a Thermo Nicolet Continuum infrared microscope equipped with a MCT detector (sampling was guided by the results of the MA-XRF analysis). Spectra (128 scans) were acquired at a 4 cm−1 resolution in the 4000–600 cm−1 range (spectra are not provided and will be included in a future paper dedicated to a more in depth characterization of the materials using destructive analysis). The painting was radiographed with a Spellman Lorad LPX200 portable X-ray and using a CARESTREAM INDUSTREX Flex HR Digital Imaging Plate (14 × 17 in). The plate was processed using the CARESTREAM INDUSTREX HPX-1 Computed Radiography System. The seven X-rays were stitched together using Adobe Photoshop. MCR-ALS was carried using the SOLO+MIA software package from Eigenvector Research Inc. The M6 Jetstream raw files were imported using the Lispix Raw formatted image importer (LISPIXRAWREADR). The MCR-ALS analysis considered the full spectral profile between 1 and 30 keV and the depth dimension of the spectral data cube was compressed (5 points binning—final spectral resolution equal to 50 eV). The data was Poisson scaled before the analysis  to enhance the signal and thus contribution of the elements that are less prevalent or to which the instrument is less sensitive. MCR-ALS is a bilinear factor decomposition method solved by means of ALS optimization [19, 20]. The model can be described in linear algebra terms by D = CS T + E, where D is the experimental matrix that contains the spectra of all the pixels in the image; S T (spectra) and C (concentration profiles) are the factor matrices obtained by the bilinear decomposition and correspond respectively to the pure spectral signatures and the related distribution maps of the pure components extracted; E refers to the non-modelled noise/error/residual contributions matrix. MCR-ALS is an iterative method that requires the input of the number of pure components and an initial estimate of their spectral signature at the starting point. The number of components may be known beforehand based on the knowledge of the system (number of paints Mondrian may have used and identified visually) and of its chemistry (number of pigments and fillers expected based on the elemental maps and previous analysis). The number of pure components can also be estimated using Principal Component Analysis (PCA) which provides the number of components needed to explain the variance in the data in a satisfactory way [19, 30] or by determining the data matrix rank using singular value decomposition (SVD) . In the case of XRF mapping data, however, this estimation was not straightforward. In the end, the MCR-ALS analysis was repeated using different numbers of pure components in order to select a model that ultimately provided interpretable information and fitted the data in a satisfactory way. MCR-ALS also requires the input of initial estimates of the pure component spectra. Reference spectra can be used if available but this is not feasible in the particular case of XRF analysis of heterogeneous layered materials such as paint layers in a painting, although methods have been proposed to correct for intra and interlayer absorption effect [9, 32]. Instead, initial estimates can be extracted in an interactive way from the data using a method such as SIMPLISMA (SIMPLe-to-use self modelling mixture analysis)  or automatically, and in an iterative way, using a method based on the selection of the purest pixel in the image data set . This last method was chosen and is available in the SOLO+MIA MCR-ALS options (exteriorpts). Constraints can also be imposed, the most common being non-negativity as expected for contributions (concentrations) and spectra. Contrast enhancement of both spectra and contributions (or distribution maps in the case of image analysis), was used as well to facilitate the interpretation of the MCR-ALS results. Contrast enhancement provides components which are as orthogonal as possible within the boundaries of the other constraints used (in this case non-negativity) and without significantly increasing the lack-of-fit of the model . The main criteria for the quality assessment of the MCR-ALS final results were the interpretability of the distribution maps and XRF spectra supported by the examination of the painting under normal light, UV light, X-radiography and complimentary analysis done on samples. OriginPro2015 from OriginLab Corp was used for some of the graphs. The section below summarizes the observations based on the examination of the painting, elemental maps and pure components distribution maps and signature spectra extracted by MCR-ALS. The elemental composition of the paints is summarized in Table 1 and a tentative list of pigments and fillers is proposed. The visual examination of the painting provides a great insight into the artist process. The palette is limited to five colors, yellow, red, blue, gray and white, though all have subtle nuances in tonality across the painting. These nuances are quite striking under UV light (Fig. 2) and suggest Mondrian may have used paints with the same tonality but different composition and thus possibly different brands. The painting was spray varnished with Acryloid B67 in 1977  and thus the uneven and patchy fluorescence observed must be related to the composition of the paints and not the varnish. The white fields, for instance, appear rather homogenous in color under normal light but were painted and retouched using two seemingly different white paints, one of them with a light-yellow fluorescence under UV light. There are clear differences as well in the tonalities of the yellows paints, although all appear to be cadmium yellow based as suggested by the greenish fluorescence under UV light . Some of the red and blue areas also have a patchy appearance and seem to have been retouched and reworked to obtain a lighter tonality. The top and under layers have a different appearance under UV light from the darker color underneath. Examination under the microscope confirms that practically all the small and large shapes were reworked in successive campaigns, sometimes by altering just the tonality (Fig. 4a), other times by applying a totally different color (Fig. 4b). Mondrian would generally leave a gap between adjacent fields to keep the colors pure, often leaving the ground exposed (Fig. 4c): in 1943 he wrote, “Color can vivify a great plain plane but not entirely annihilate its appearance as entity. It has to be divided” . Evidence of paint scraping (Fig. 4d) suggests Mondrian sometimes removed the paint before applying a new layer, while other times he painted right over it. Red paint (and occasionally blue paint) is oozing through cracks in the upper yellow layer in many places (see Fig. 4e). Other traces of his creative process include pencil lines (Fig. 4f) sometimes applied over a painted area, possibly to outline the limit of a field before applying a new paint layer. The X-radiograph of the painting (Fig. 3) shows short thin streaks across most of the painting and in different directions. The streaks are clearly visible in the large white fields but also run across the colored shapes. They do not match the brushwork on the surface and the pattern is not reproduced in any of the elemental maps obtained by MA-XRF. These streaks in the X-ray are unusual and have not been observed or reported for other paintings by Mondrian [2, 37]. They may be the results however of a past conservation treatment: when Broadway Boogie Woogie was wax lined in 1958, “the reverse had to be gone over with a sharp scalpel to remove all the tiny buds of paints and priming which had penetrated to that side and which would have existed as lumps between the two fabrics” . This scraping could have created the streak pattern seen in the X-ray. Based on the visual examination alone, it is possible to start reconstructing Mondrian’s creative process and acknowledge the variety of materials he used. In XRF analysis, whether used in spot analysis or mapping mode, the identification of chemical elements is based on the presence of characteristic peaks in the XRF spectrum. The nature of the inorganic (and in some particular cases organic) ingredients in paints including pigments, fillers and additives can be inferred from the elements present and the color of the paint. Using the two XRF techniques, the following 20 elements were detected: Mg, Al, Si, P, S, K, Ca, Ti, Cr, Fe, Cu, Zn, Sr, Zr, Cd, Ba, Pb, Se, Rb and Nb. The first three elements could only be identified by XRF spot analysis and their distribution maps is therefore not available. The rest of the elements were identified in the overall spectral summation and the maximum pixel intensity spectra and confirmed with XRF spot analysis. The most representative elemental distribution maps obtained with PyMCA/Datamuncher for the top left section of the painting are presented in Fig. 5. The conclusions below are based on the examination of these maps supported by the examination of the painting and complimentary analysis. 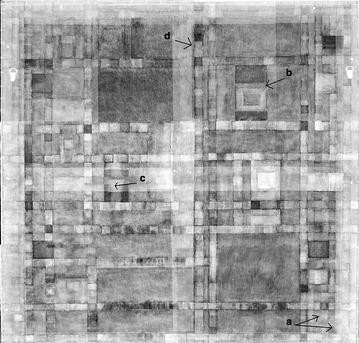 Ground layer The Pb distribution map indicates that this element is present throughout the painting as confirmed by X-radiography and XRF spot analysis. The attenuation of the Lα1 emission line versus the Lβ1/Lβ2 line in the MA-XRF summation spectrum and XRF single spot spectra indicates that Pb is present in an under layer  most probably as a lead white ground. The highlights in the Pb map correspond to the exposed ground between color fields and to areas where the paint layer is thinner or where the paint is more transparent to the emitted fluorescence. The canvas weave is clearly revealed in those areas. Inpainted areas The painting has required conservation treatments over the years: cleaning, wax lining, varnishing, paint consolidation and inpainting to cover losses, cracks and the red oozing paint . Inpainting of the edges of the painting is clearly visible in the Ti and Ca maps and is consistent with the information in the conservation reports (white Magna methacrylate colors and mixture of gesso and a PVA emulsion respectively). The highlights in the Cr map, on the other hand, correspond to the inpainted cracks in the yellow. The overall Cr map for the painting (Fig. 6a) shows the full scope of the consecutive inpainting campaigns. The close up in Fig. 6b–d shows how the Cr map matches the Se map confirming that the Cr based paint was applied to mask the oozing red paint (see composition of the red paint below). The maps also evidence areas that were scrapped before applying the yellow top layer. White background and gray paints Examination of the maps indicates that the elements present in the white and gray painted areas are P, S, Ti, Ba, Zn, Sr and Nb. Although the distinction between Ba and Ti is difficult to make in XRF spectra due to the substantial overlap of their characteristic emission lines , the MA-XRF summation spectrum and XRF single spot spectra confirm that both elements are present based on the offset and broadening of the BaLα and BaLβ lines and atypical intensity ratio. All these elements are also present in the areas painted in blue in particular the lighter shades indicating the white paint was mixed with the blue paint. The presence of Sr and S indicate that Ba is present in the form of barium sulfate, as confirmed by FTIR analysis. Sr is a common impurity in barium sulfate . Nb, on the other hand, is a known impurity in titanium oxide pigments . The intensity of the Zn peak is significant suggesting it is probably present as zinc white and not just as a filler or additive, and lithopone (a mixture of zinc sulfide-30 % and barium sulfate-70 % ) may also be present. The MA-XRF technique has low sensitivity to P but the XRF spot analysis shows that the white paint that fluoresces under UV contains a significant amount of this element. P may be associated to the presence of a pigment coating or paint additive  but further analysis is needed to identify its source and explain the fluorescence. These results are in agreement with the past analysis by PLM and SEM–EDS  that identified a titanium oxide/barium sulfate composite pigment  mixed with zinc white and barytes. Mondrian was using Permalba White at the time which is known to contain zinc white, titanium white and barium sulfate . Examination under UV light evidences the presence of two different gray paints, one with a slight fluorescence and the other one not, similar to the white paints. The XRF spot analysis indicates the presence of Ca and P suggesting the presence of bone black which typically contains about 15-20 % carbon, 60 % calcium phosphate, 20 % calcium sulfate and impurities . Analysis carried out in the past by SEM–EDS confirms the presence of this black pigment and indicated the presence of small amounts of calcite and possibly quartz . Red and yellow paints The Cd distribution maps (based on the fitting of the Cd(Kα) and Cd(Lα) peaks) show that this element is present in both the red and yellow paints suggesting the presence of cadmium yellow (cadmium sulfide, CdS) and cadmium red (cadmium sulfide and selenide CdS.CdSe) pigments . The Cd (Lα) is mostly representative of the cadmium on the surface while the Cd(Kα) map corresponds to the cadmium on the surface and under-layers. This last map clearly shows that the shapes in the background were originally larger and painted in red (see also Se map). Mondrian later divided them by partially painting over with gray and in other areas of the painting with yellow. The overlap of the Cd(Kα) and Se(Kα) maps helps distinguish the cadmium yellow and cadmium red as shown in Fig. 7a for the whole painting. The image also confirmes that the red was initially far more prominent, with vertical and horizontal red bars interlaced with yellow ones. Some of the bars were initially one inch wide but both the Cd(Kα) map and X-ray show they were later slightly widened. Mondrian then proceeded to cover most of the red with yellow, blue and gray squares. A schematic of what the painting may have looked like in an earlier stage is shown in Fig. 7b. This resembles other compositions Mondrian started in New York with interlacing colored bars namely New York City 1 (unfinished), 1941 (CR nr. B300), New York City, 1942 (CR nr. B301) and New York City 2 (unfinished), 1942 (CR nr. B302) . This is also in agreement with Charmion Von Wiegand’s memoirs  who recalled “In their initial stages, both Boogie Woogie pictures (Victory Boogie Woogie and Broadway Boogie Woogie) were conceived in lines of primary color and seemed a continuation of New York (1942) and the two related compositions that remain unfinished in tape”. She also comments on Mondrian’s use of strips of colored tapes to develop his compositions, a method he was using since the 1930s but used abundantly for his New York compositions. The painting had been started in June 1942, and by October 1942, Von Wiegand noted in her diary  that the solid bars in Broadway Boogie Woogie had given way to bands composed of small blocks, both colored and gray. 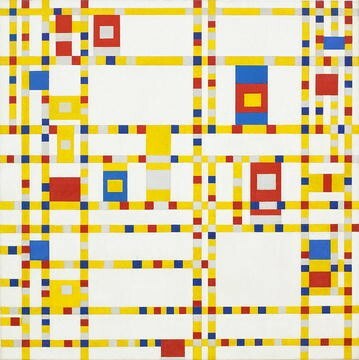 Although Mondrian would reportedly scrape off the paint before applying a new layer to keep the surface level even [2, 37], he did not do it consistently in Broadway Boogie Woogie as seen in the detail in Fig. 6. It is not clear at this stage why he chose to remove only part of the red under-layer. The differences in the yellow tonalities he overpainted with, suggest these layers were added in separated campaigns. The overpainting of the red with yellow has led to the current condition issues, with the red and occasionally the blue paints oozing through the cracks in the yellow paint. While these cracks were mentioned for the first time in a conservation report in 1977 , the oozing was only noted in 1990 and seems to be a recurring issue. This phenomenon is currently being investigated. Several hypotheses are being considered including the composition and mechanical failure of the yellow and red paints, the successive conservation treatments including the heat that was used during wax lining, or Mondrian’s technique and how soon he applied the yellow over the red. The oozing issue has been observed, though not so dramatically, in two of his earlier compositions in the MoMA collection (Fig. 8). Beside Cd, the areas painted in yellow also contain S as well as a significant amount of Zn suggesting either the presence of the light cadmium yellow pigment that is prepared by co-precipitation of CdS with a Zn soluble salt to obtain CdS[(Cd,Zn)S] or a mixture of pure cadmium yellow and zinc white and/or another source of Zn . Ba is also present in a different yellow Mondrian used in a few selected areas (circled in red in Fig. 5), potentially as cadmopone (cadmium–barium yellow CdS(Zn).yBaSO4 ) identified in the past . Lead azelate and zinc stearate were identified by FTIR analysis. Zinc carboxylates were identified in the cadmium yellows in Victory Boogie Woogie  which was painted around the same time. The presence Al and Zn stearates additives has been reported in paint formulations by Haagsche Kunstschilderverven Fabriek (HKS), Windsor & Newton (W&N), Talens and Maimeri . They act as dispersion gelling agents and are thought to play a role in paint failure and instability of modern oil paints . The presence of the carboxylates, in particular the lead azelate, may also indicate the formation of soaps in the paint layer . Mondrian was using cadmium red based paints consistently since the 1920s [46, 50, 51]. Based on the elemental maps, the red paint contains Cd, S and Se, together with varying amounts of Ba and Sr. Barium sulfate can be present as an extender or co-precipitated with cadmium selenide sulfide. Also called cadmium barium red and cadmium barium yellow, cadmopones were first introduced in 1926  as a less expensive alternative to the cadmium based pigments. Analysis carried out in 1993 also detected the presence of an organic pigment in the lower layers of red paint . Lithol Red R and Helio Red RMT on the other hand were identified in Victory Boogie Woogie . Further analysis is required to confirm the presence and identity of the organic pigment that cannot be detected by XRF. Blue paints The spot analysis with the handheld XRF detected the presence of a significant amount of Al, Si and K, indicative of the presence of ultramarine  (low atomic elements Al and Si are difficult to detect with the mapping instrument especially when a varnish is present , while the K(K) line overlaps with a Cd(L) line and is not easily fitted with the PyMCA/Datamuncher approach). The presence of ultramarine has been confirmed by FTIR analysis, and so was the presence of gypsum which is in agreement with the Ca map. The Cu and Fe maps suggest the presence of two different blue paints, one richer in Fe and a second one richer in Cu though the concentration of these elements is small. 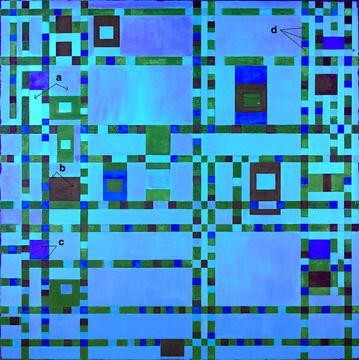 Iron is commonly found in synthetic ultramarine as an impurity  but it could also indicate the presence of Prussian Blue (Fe4[Fe(CN)6]3), while Cu might be related to the presence of phthalocyanine blue, a pigment used by Mondrian in in Victory Boogie Woogie . The FTIR analysis could not confirm the presence of phthalocyanine blue or Prussian Blue. Traces of Rb, possibly an impurity, were also detected by XRF spot analysis. MCR-ALS analysis was conducted on the seven XRF mapped areas. The results were similar and are presented for the same area as in Fig. 5 for direct comparison of the two approaches. Several MCR-ALS models were built with increasing number of components between four (based on the PCA analysis that indicated a minimum of four components to explain 86 % of the variance in the data) and 12 (number of paints expected based on the visual examination above and including inpainting and ground layer). Ultimately, a six component model was selected for the MCR-ALS analysis with the image contrast enhancement and eight components for the model with spectral contrast enhancement. This final choice was based on the interpretability of the results supported by the examination of the painting and both model accounted for at least 96 % of the variance. Examining the pure component maps and corresponding signature spectra shows that image (Figs. 9, 10) and spectral (Figs. 11, 12) contrast enhancement constraints lead to complimentary results. The image contrast was able to resolve paint layers while the spectral contrast resolved the ingredients in the paints namely pigments, co-precipitates and fillers. The variance explained by each individual component is included with the maps. It does not represent, however, a direct measure of their abundance as the data was Poisson scaled and XRF sensitivity increases with Z. The spectral enhancement constraint maximizes the difference between the signature spectra of the different components and provides a better separation of the pure or co-precipitated compounds in the paints. The maps and corresponding spectra are presented in Figs. 9 and 10. Pure Component 1 Based on the distribution map, this component is present primarily in the white and gray paints. The spectrum indicates it contains P, S, Ba, Ti, Sr and traces of Nb. This is consistent with the presence of a titanium white/barium sulfate pigment (Sr and Nb are known additives and impurities) and a P based additive. This component is also present in the blue and red areas, but it is not apparently correlated with the tonality of the paints and might thus be related to paint layers underneath. Pure Component 2 This component is abundant in the white, gray and yellow areas. It is also present in the blue, in a way that is correlated to component (1). The elements identified in the corresponding spectrum are S and Zn. The Zn to S ratio is high suggesting that zinc white may be present as well as zinc sulfide. The presence of zinc sulfide could indicate the presence of the cadmium-zinc sulfide pigment in the yellow paint and lithopone in the white paint. Pure Component 3 This component is present in the yellow paint and to a lesser extent in the red paint. Based on the signature spectrum, it contains Cd and S. The pure component spectrum only shows the Cd(L) lines indicating this component is present on the surface. Cadmium sulfide is present in the yellow and possibly as a co-precipitate with ZnS (component (2)) and with CdSe in the cadmium red based paint. It is also possible Mondrian mixed the yellow and red paints to produce the lighter red top layer which could also explain the uneven yellow-green fluorescence under UV light. The analysis of cross section would help clarify this question. Pure Component 4 This component is present in the red top layer and hidden layers. The spectrum indicates the presence of S, Ba, Se and Sr but no Cd as would be expected for the cadmium red or cadmium-barium red cadmopone pigment Cd(Se/S).yBaSO4 . CdS is common to both red and yellow pigments which is why MCR-ALS, when used with the spectral enhancement constraint, sees it as a singular component (component 3) which can be misleading. Pure Component 5 This component corresponds to the ground layer. The main element present is Pb, indicating the presence of a lead white preparation layer, and small amounts of Ca and Fe that may be present in the ground but are also common elements in canvases. Pure Component 6 This component corresponds to areas painted in blue and contains Mg, Al, Si, S, K, Ca, Fe, Cu, Sr and Rb. Most of these elements indicate the presence of ultramarine and illustrate how MCR-ALS analysis can extract the very small contribution of the low Z elements that are otherwise difficult or even impossible to visualize in the form of elemental maps. MCR-ALS was not capable however of separating the small Cu and Fe contributions and extract two different blue paints. Pure Component 7 This component is present in both red and yellow paints. The major peaks in the spectrum correspond to the Cd(Kα) lines suggesting the component corresponds to cadmium red and cadmium yellow in under-layers. Other elements are S (cadmium sulfide) and Ca (difficult to confirm by XRF spot analysis because of the overlap with a Cd(L) line), and Zr (generally associated to the presence of a paint drier ). Pure Component 8 This component corresponds to the inpainted areas to cover the cracks in the yellow paint and the oozing red paint. Based on the spectrum, this paint contains a Cr based yellow paint. The component spectral enhancement constraint maximizes the difference between the pixel contributions and thus provides a better separation of the paint layers and a more direct information of the composition of the paints instead of paint ingredients. The maps and corresponding spectra are presented in Figs. 11 and 12. Pure Component 1 This component corresponds to the white paint present in the white background that was also used in the gray paint and in the lighter blue. Based on the elements identified in the spectrum, P, S, Ti, Ba, Zn, Sr and Nb, the paint contains titanium white, barium sulfate and or lithopone and a phosphate additive. Nb and Sr are impurities. There are in fact two white paints with very similar composition except for the presence of P in the paint that fluoresces under UV. The spectral contribution of the P however is too weak for MCR-ALS to unmix the two paints. Pure Component 2 This component corresponds to the yellow paint. The elements in the spectrum are S, Zn, Cd and Zr suggesting the paints contains cadmium yellow co-precipitated with zinc sulfide (light cadmium yellow) and/or cadmium yellow mixed with zinc white in different proportions in the darker yellow underlayer and lighter yellow top layer. Zr must be related to the presence of a paint drier. Pure Component 3 This component corresponds to the red paint and according to the spectrum it contains S, Ba, Se, Sr and Cd. The pigment present is cadmium red (cadmium sulfide selenide) with a barium sulfate filler and/or a red cadmopone (co-precipitate of cadmium red and barium sulfate). Pure Component 4 According to the map, this component corresponds to the ground layer. Although it was established above that it contains mostly Pb, as well as some Fe and Ca, the spectrum also indicates the presence of Cd (L lines suggest it relates to Cd on the surface), and also Ba and Zn. It is not clear at this stage why a contribution from these elements is included in this component. A possible explanation is that MCR-ALS is capable of extracting the secondary fluorescence of the surface Ba and Cd caused by the excitation of the lead white preparation layer. Pure Component 5 This component corresponds to the blue paint. The elements identified in the spectrum are Mg, Al, Si, S, K, Ca, Ba, Ti, Fe, Cu, Zn, Sr and Rb. These elements are consistent with a mixture of the white paint with a blue paint containing ultramarine blue (Al, Si, K) and a source of Ca (gypsum). The source of Cu and Fe needs to be investigated and Rb is probably an impurity. Mg is present in this component and appears to be present in fact in most components, although the peak is very weak and could only be confirmed by XRF spot analysis for the blue paint. Magnesium carbonate was identified in the blue paint Mondrian used in Victory Boogie Woogie . Mg salts are common additives in oil paints  and can lead to the formation of magnesium sulphate heptahydrate and contribute to the water sensitivity of oil paints . This problem is mentioned for the red and yellow paints in the Broadway Boogie Woogie treatment reports . The MCR-ALS with image contrast enhancement could not separate the two blue paints either. Pure Component 6 This component corresponds to the paint that was used to retouch the cracks in the yellow paint and cover the oozing red paint. Based on the spectrum, this paint contains Cr, Zn and Pb which could correspond to chrome yellow and/or zinc yellow. The other elements present are Cd, Se, Ba, Sr, which are elements present in the yellow and red paint that are covered by the thin inpainted layer. Table 1 summarizes the information available so far on Mondrian’s palette for Broadway Boogie Woogie. Further complimentary analysis is required to confirm the composition of the paints and the stratigraphy. The XRF mapping results will definitely help guide the necessary sampling in order for example to identify the source of P in the white paint and potential link to the fluorescence of the paint under UV, to confirm the presence of Mg based additives and connection to the water sensitivity of the red and yellow paints, to corroborate the presence of two different blue paints and identify the source of Fe and Cu and to determine if the cadmium yellow and cadmium red are present in their pure form or co-precipitates or both. Examination and XRF mapping have significantly advanced our understanding of Mondrian’s masterpiece Broadway Boogie Woogie in a noninvasive way, from his creative process and evolution of the composition, to the materials he used and how they were combined and applied, as well as the evolution of the painting over the past decades and its condition issues. More analysis is required now to confirm and expand these findings but it is clear that the deceptively straightforward composition is the outcome of a very elaborate and thoughtful process. Mondrian reworked the surface extensively, starting with yellow and red interlacing bars that he then transformed by adding red, blue and gray squares and larger shapes in the white background, and modifying them over several iterations changing their color, tonality or dimension. The multivariate image analysis approach provided complimentary information to the elemental maps. MCR-ALS decomposition method was able to simultaneously extract and help identify the pigments and fillers in the paints and at the same time virtually separate the different paint layers. In addition, the method is able to extract the contribution of trace elements and low Z elements otherwise difficult to identify and confirm, even with XRF spot analysis, because of the low signal to noise ratio. Some ambiguity still remains in the interpretation of the MCR-ALS results. It was not possible for example to separate paints that have a very similar composition like the two white paints and the two blue paints, or to separate the different layers of red and yellow paints. Performing the MCR-ALS analysis over smaller areas or narrow spectral regions may improve the unmixing of the paints. More elaborate pre-processing methods may help remove the influence of the background, scattering and noise. Ultimately, analysis with complimentary techniques, including invasive ones, is required for a complete characterization of the materials, and to validate the MA-XRF/MCR-ALS analysis but this study illustrates the breadth of information that can be obtained in a non invasive way with macro XRF mapping. AM, JD, CA: made substantial contributions to conception and design, or acquisition of data, or analysis and interpretation of data. AM, CA, CMG, JD: involved in drafting the manuscript or revising it critically for important intellectual content. All authors read and approved the final manuscript. The authors would like to acknowledge the Samuel H. Kress Foundation for their support of the initial stages of the MoMA Mondrian project from 2009 to 2010, Anny Aviram (conservator) and Jim Coddington (chief conservator) at The Museum of Modern Art for comments, Matthias Alfeld (AXES Research Group, Department of Chemistry, University of Antwerp, Belgium) for support with MA-XRF data handling, and the Netherlands Organization for Scientific Research for their support in the form of a VIDI Grant for Joris Dik, enabling the MA-XRF part of this study.